Improvelocity is eager to share with you, the excitement, joy and awe that results from spontaneous musical creativity! You are not a spectator but a participant! Sunday, January 24, 10:30 a.m. Suggested donation: $10. Advance ticket purchases through the office encouraged. Tickets will also be sold at the door. The concert will be followed by a light reception, both to be held in Pilgrim Hall at Creative Arts. Please call the office at 781.942.9600 for more information. Featuring- Andrea Loretz-Frey, Soprano / Roald Wilson, piano and other great musicians ! * Please note: this performance is postponed with date to be announced! New Musician auditions & scheduled music sessions MA and CT.
if we could hear them what would they say? 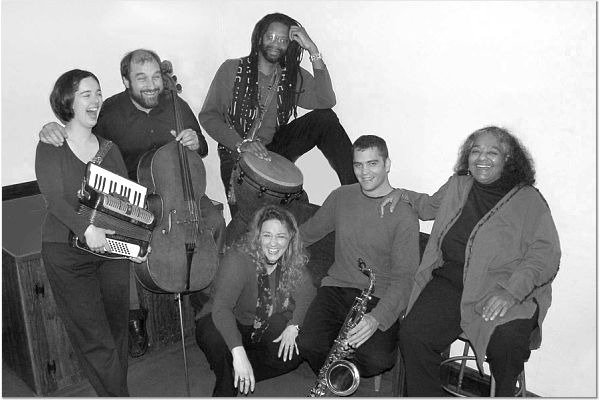 "This versatile music troupe brings you a unique music experience every time they play. We were lucky enough to attend and record from a recent rehearsal and sit down and talk with these extremely talented and charming musicians." St. John�s Episcopal Church, 74 Pleasant St. (Rt.60), Arlington Center, MA. Free admission but donations to our CD Fund are always welcome. "Let Peace Begin With Me"
Improvelocity - Live ! "Like a kaleidoscope for the ears!" May 12, June 16 & June 23 at the Third Life Studio Download the pdf flyer for complete information. Audience Members form the energetic container for collaborators & Improvelocity to create magical moments for your senses and your soul! Call 781-963-3299 or email Improvelocity@comcast.net with questions or for more details. Friday, June 23, 8 pm, Drawn Together at the Third Life Studio, 33 Union Sq./Somerville Ave. Somerville MA. Improvelocity invites Visual Artists to sketch and display your images inspired by our music at part 3 of The Audience Collaboration Series at The Third Life Studio. Download the pdf flyer for complete information. Friday, June 16, 8 pm, Poetic Passion at the Third Life Studio, 33 Union Sq./Somerville Ave. Somerville MA. Improvelocity invites Poets and Authors to read your original work (up to 24 lines of poetry or about 100 words of text) then hear it set to our music at part 2 of The Audience Collaboration Series at The Third Life Studio. Download the pdf flyer for complete information. Friday, May 12, 8 pm, Motion Merger at the Third Life Studio, 33 Union Sq./Somerville Ave. Somerville MA. Improvelocity invites Dancers and Movers to express yourself through our music at part 1 of The Audience Collaboration Series at The Third Life Studio. Download the pdf flyer for complete information. January 14, 7:00 pm, Performance in Third Life Studio, 33 Union Sq. (Somerville Ave.), Somerville MA. October 1, 7:00 pm , The Mystical Art and Talent Show, Cambridge Swedenborg Chapel, 50 Quincy Street, Harvard Square, Cambridge. $10 at the door. June 9, 8:00 p.m., the Tribe (an artists collaborative of comedy, theater, and music, presenting five acts including Improvelocity) at the Cantab Lounge, 738 Mass Ave. Central Square, Cambridge. Tickets $10 at the door, $7 in advance. June 11, 12:00 noon, the Amazing Things Arts Center, Pinefield Shopping Plaza, 55 Nicholas Road, Saxonville, Framingham. Free concert to benefit the Center. May 8, 7:00 p.m., "Guest Troupe" performing at Improv Boston's Sgt. Culpepper Improvisational Jamboree. February 13, 7:00 p.m., "Guest Troupe" performing at Improv Boston's Sgt. Culpepper Improvisational Jamboree. 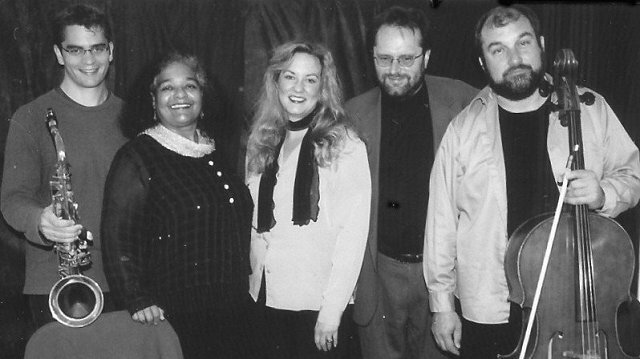 February 28th, 2005 Public Access Channel, Arlington: Improvelocity interview in TV show Art a` la Carte, Chrissy Barthelette, producer. We are also available for workshops and other events. Talk with us about your idea! Improvelocity: "Improvising music at the speed of sound!"